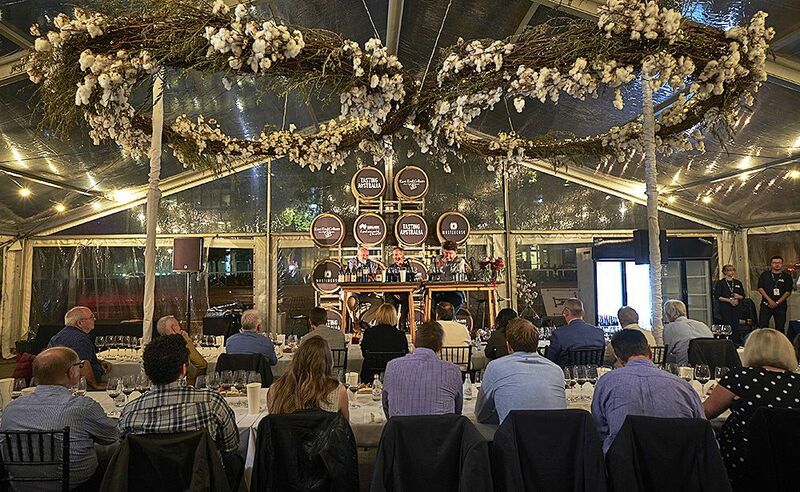 Nick Ryan described the masterclass featuring two of Australia’s most reclusive but collectable winemakers, Chris Ringland and Drew Noon, as evidence of the bespoke nature of Tasting Australia’s wine master classes. A shot of David Noon from ‘The Great Australian Wine Book’ I did with Robert Mayne in 1982 : Photo © Milton Wordley. I attended a few of the ‘East End Cellars’ master classes, enjoyed them all but for me the Ringland / Noon event was the most interesting. I used to buy wine from Drew’s father back in the late 70’s, but have not had the opportunity to taste the wines recently. I wasn’t disappointed, I really enjoyed them. Drew was one of Australia’s early MW’s. 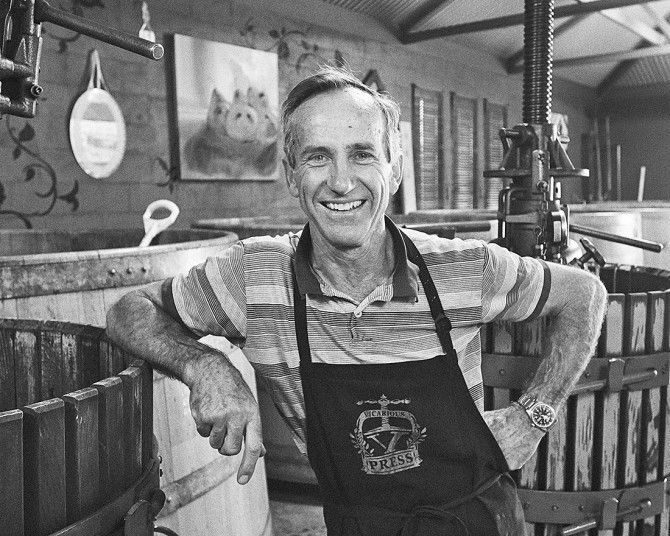 He and his wife Reagan took over Noons in McLaren Vale in 1996. You can only buy their wine by being on the mailing list, or at Cellar door, at a couple of retail outlets or cellar door on the three weekends a year that they open ! They sell out every year. I caught up with Drew recently during the last days of the 2018 vintage and hope to get together with Chris Ringland one day soon. The Tasting Australia Master Class ? At the outset I wasn’t sure about the idea of a joint Ringland /Noon event but it worked really well. 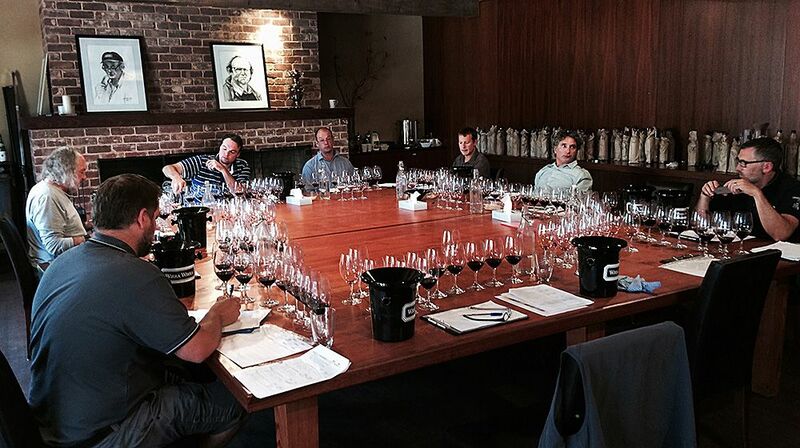 Tasting Australia’s ‘East End Cellars’ Ringland / Noon Master Class : Photo © Milton Wordley. It was great to catch up with Chris again, I hadn’t seen him for years. I think it made for a more interesting topic for the people attending as it covered two quite different wineries. 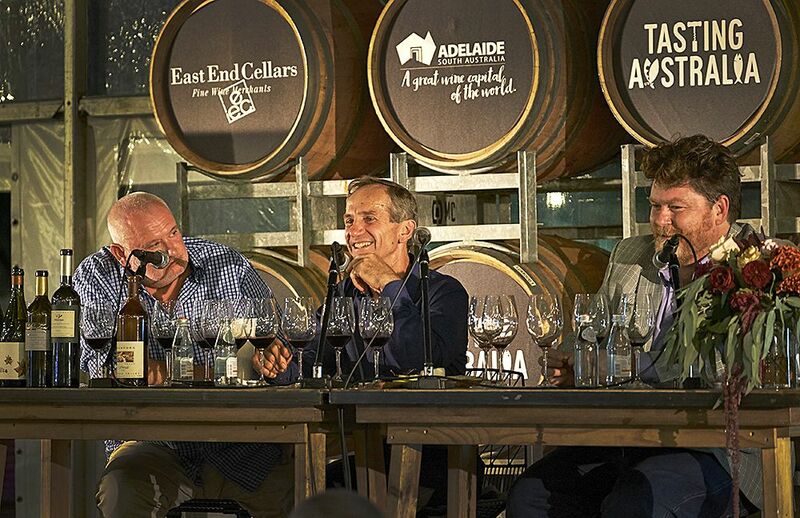 Drew and Chris on stage with Nick Ryan at the Tasting Australia’s Master Class : Photo © Milton Wordley. Nick Ryan did a superb job of anchoring the night. So we did remarkably little talking about the seasons and more about the wines, which worked really well for me. The Ringland Shirazs were great wines. But for me and I think many others on the night, the stand out wine of the 12 we looked at was the Alto Moncayo Garnacha 2013, which Chris makes in Spain. 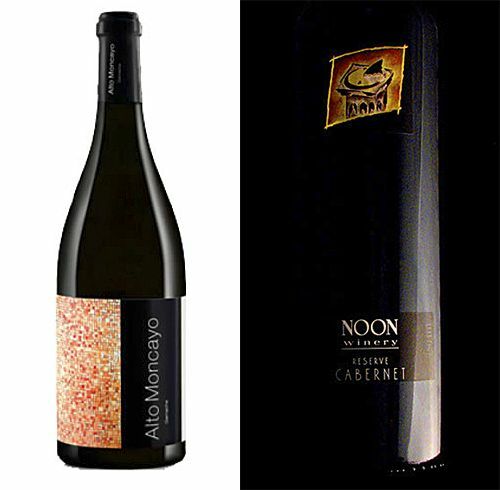 My (Milton’s) two top wines : Chris’s Alto Moncato Granacha 2013 and Drew’s Noon Reserve Cabernet 2016. Chris’s Dimchurch Shiraz 2012 was my other pick. I was surprised and actually delighted with that wine. I love the vibrancy of youth, don’t get me wrong, I like mature wines as well, but these were great young wines. 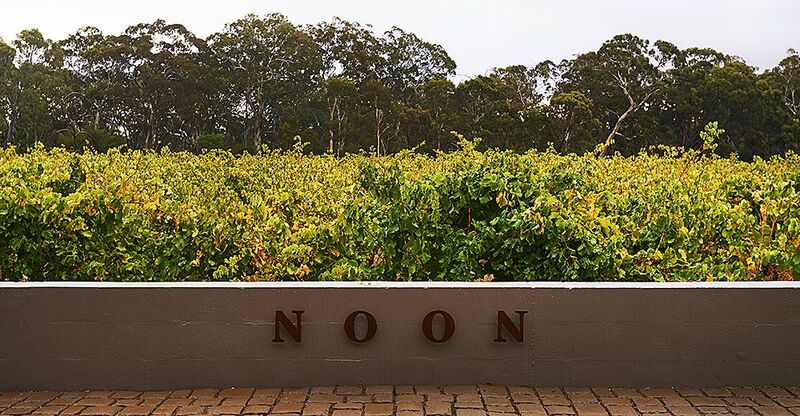 Noon Wines was established in 1976 by your parents, were they always farmers or grape growers ? No, Dad was the son of an Anglican minister who at one stage looked after the Lyndoch Parish in the Barossa. Dad grew up there and spent a lot of his early life in wine and rural areas. He didn’t follow his father into the ministry but became a language teacher, teaching French at Saint Peters College in Adelaide. 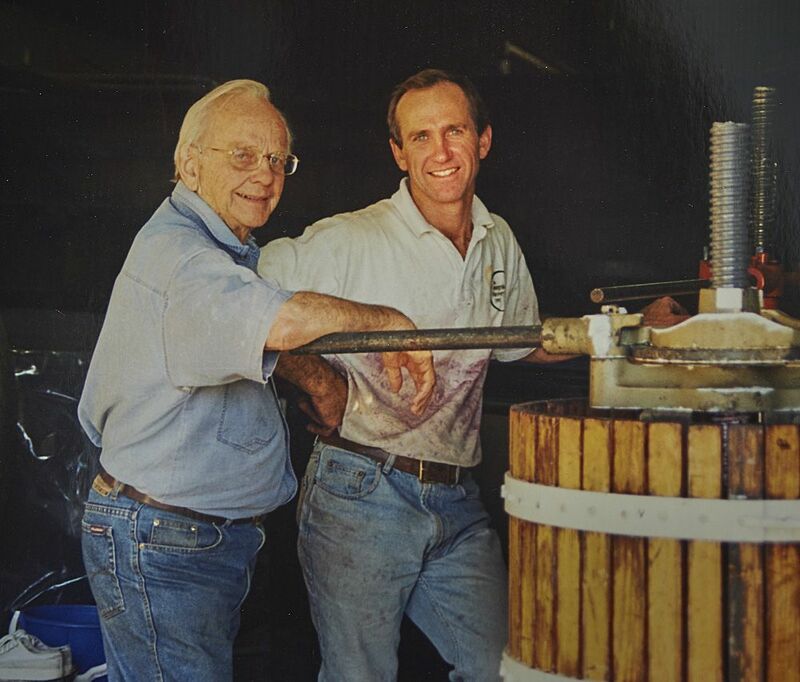 David and Drew in 1998 : Photo courtesy Noon Winery. Unfortunately Dad developed epilepsy in midlife. When he started having seizures in the classroom, he needed to make a change to the way he made a living. He had history in South Australian wine regions, as well as in France where he taught English in a little town called Auriac in the 1950’s. Mum and Dad bought a holiday house at Aldinga Beach in the ‘60’s and they really liked it down here. This led them to purchasing our vineyard in 1967; at the time it was a 24 acre mixed farm with almonds and apricots. They had trouble making a living from hand knocked almonds and apricots. 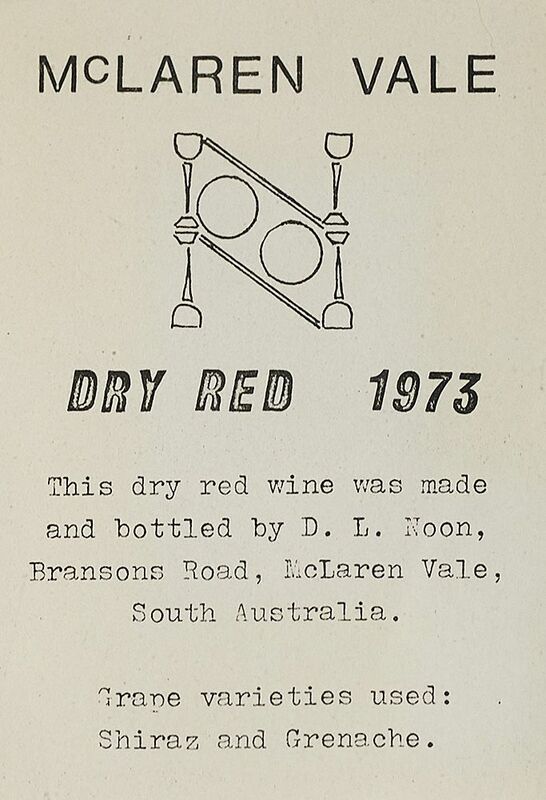 One of the first labels ‘Dry Red’ 1973. Art work by Drew’s older sister Vicki while she was still at school. Dad more and more looked towards the grapes as the main crop and started dabbling in making wine. One of the first wines he made was a Rosé, influenced by his experience in France. 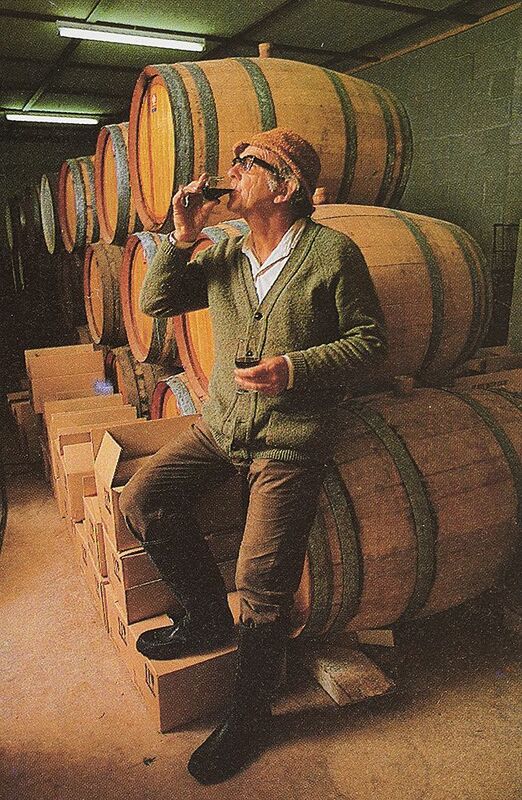 Our cellar door opened to the public in 1976. Rae & I pinch ourselves some days as we bought the place in 1996 from Mum and Dad so in a commercial sense we’ve been in charge longer than they were! 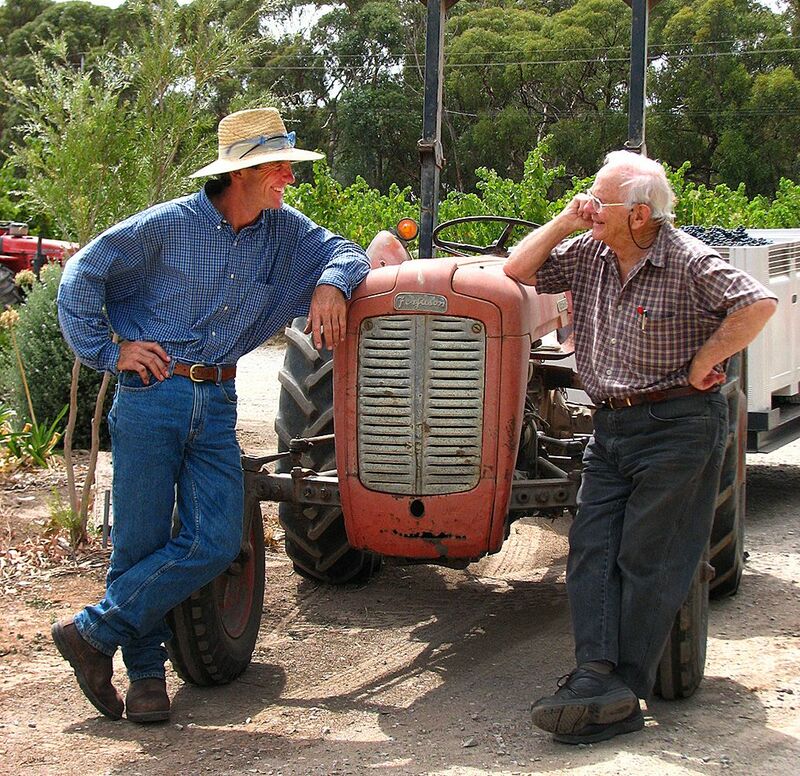 What were the early days in McLaren Vale like for you ? I grew up here and I’ve lived here for around 50 years. Luckily Rifle Range Road is a no-through road so not much has changed on this block in that time. We really appreciate the silence and the peaceful life we have here. There have been lots of changes in our region though; there’s more lights at night around the Vale, you can even see the Cube on the other side of the valley. I went to school just up the road in Willunga. It was all very small. 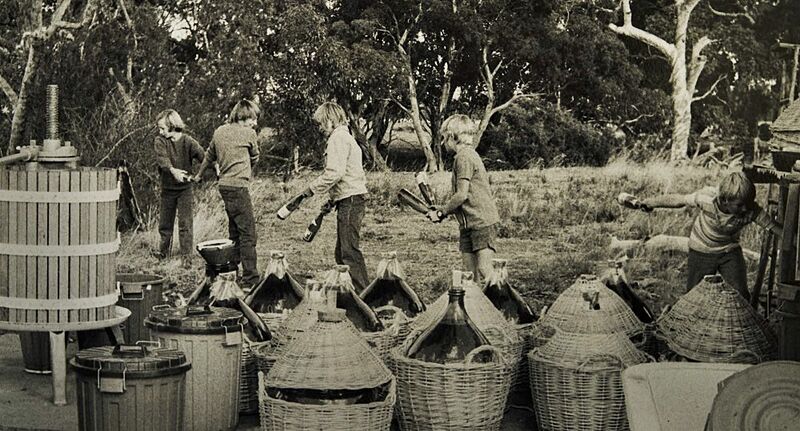 Drew and a few mates, students from Morphett Vale school helping out in the early 1970’s : Photo courtesy Noon Winery. Dad and Mum had started with not much money. 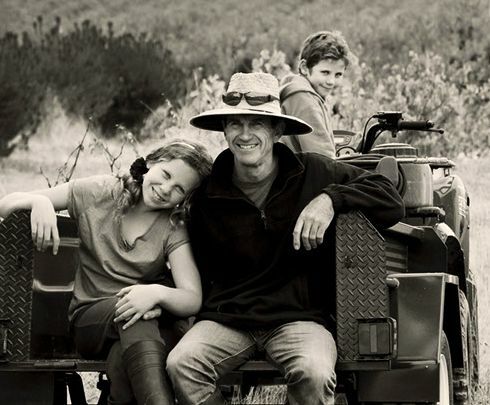 Drew Noon and his children Indi and Harper : Photo © Rae Noon. I still remember the winery shed with dirt floors. To me Dad was someone who was learning as he went. 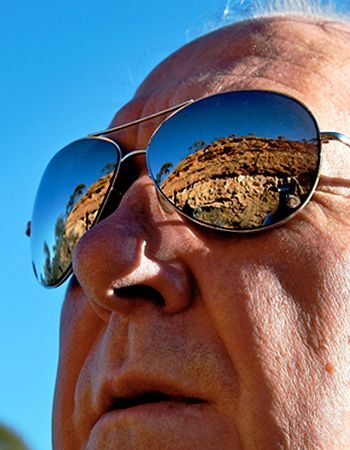 At the time I was busting to get away and see the world, McLaren Vale was just too small. I did get out and that was great, leading me in a complete circle to come happily home again. We’re conscious of this with our kids. I went off and saw a lot of larger scale wine production and eventually realised how good it can be to keep it small. But I had to see another world and it took a while. I’m thrilled to be here now. 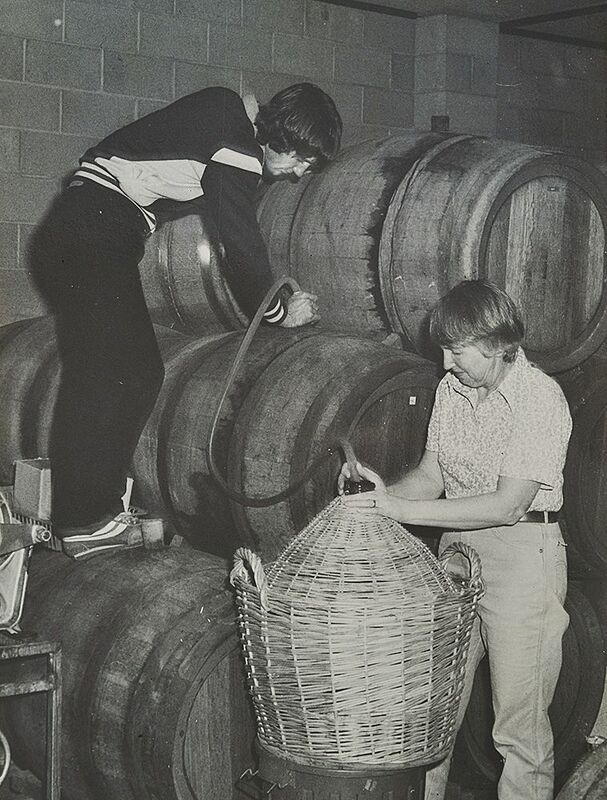 Drew at about 17 yrs old helps his mum Nerida bottling : Photo courtesy Noon Winery. When did you get an interest in wine ? I was interested from a very young age, ever since Dad started making wine in the ‘70s. I suppose I grew up with it, just kind of fell into it you might say. I have four sisters and we all used to prune and pick. Same as our kids do now, when we need help they are involved. There was a time when I half wondered if I was doing the right thing and perhaps should have looked at something else. Luckily I liked it from the very beginning and now I’m delighted I chose wine. You’re an MW, did you study winemaking ? After high school I decided to apply to go to Roseworthy Ag College to study winemaking. In those days they looked favourably on applicants with a family wine connection, and I was accepted which led to a lot of fortuitous circumstances. In our last year of study we had to do a harvest somewhere commercially to get experience. That’s something I fully support because you need to gain practical knowledge and not just focus on the technical stuff. Mentoring works very well in wine… being with someone who knows what they’re doing and learning from their experience is invaluable. I went to Tyrrells in the Hunter Valley. 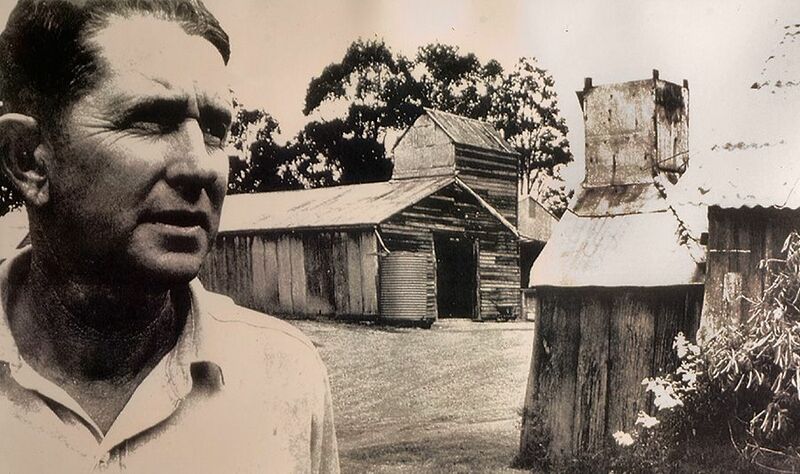 Murray Tyrrell out front of Old Hut. Photo : Tyrrell’s archive. That was when I started to realise how good this place here in McLaren Vale was. Tyrrells was full of big old barrels, sheds with dirt floors and natural ferments. John Cassergrain. Photo courtesy Cassergrain Wines. The wines tasted bloody good and so I thought maybe you don’t need all that stuff. I spent five years at Tyrrells then five years in Victoria with the Department of Ag and then five years in Port Macquarie with John Cassegrain. I thank Murray Tyrrell for a lot, he opened my eyes to the classic wines of the world, many of which I’d never tried before. He took a few of us under his wing. During harvest we’d all go out for dinner, often to a place called Blaxland’s Barn, and he’d bring wines from his cellar; mostly Burgundies but all sorts of amazing wines. When I tasted a few of these I thought ‘far out’ I’ve got to learn more about this. 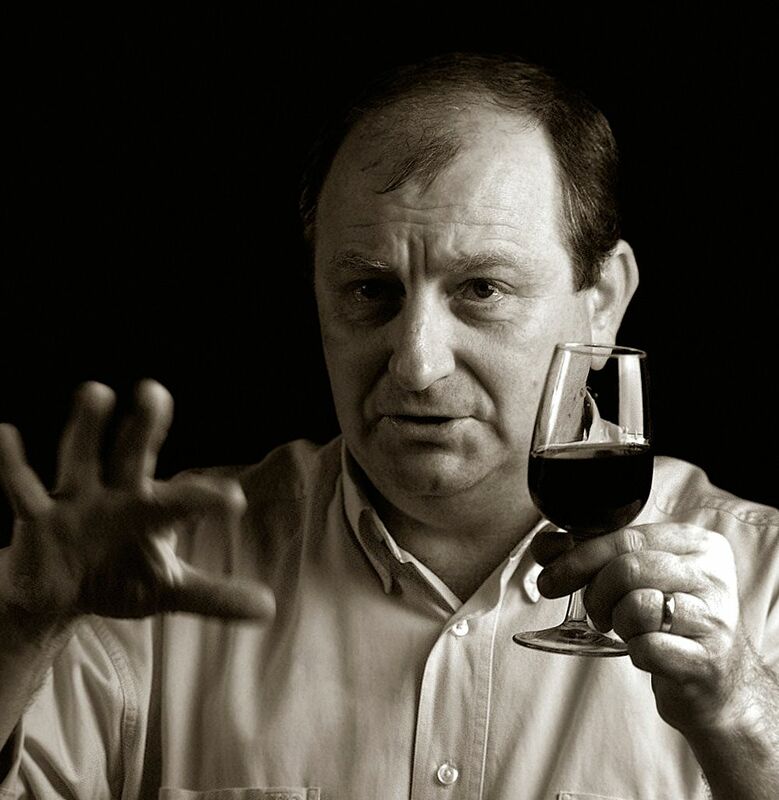 Michael Hill Smith was the first Australian to go to London and pass the Master of Wine exams. I thought about it but as a young man I couldn’t afford to go to London. So when the Master of Wine was offered in Sydney I decided to give it a go. 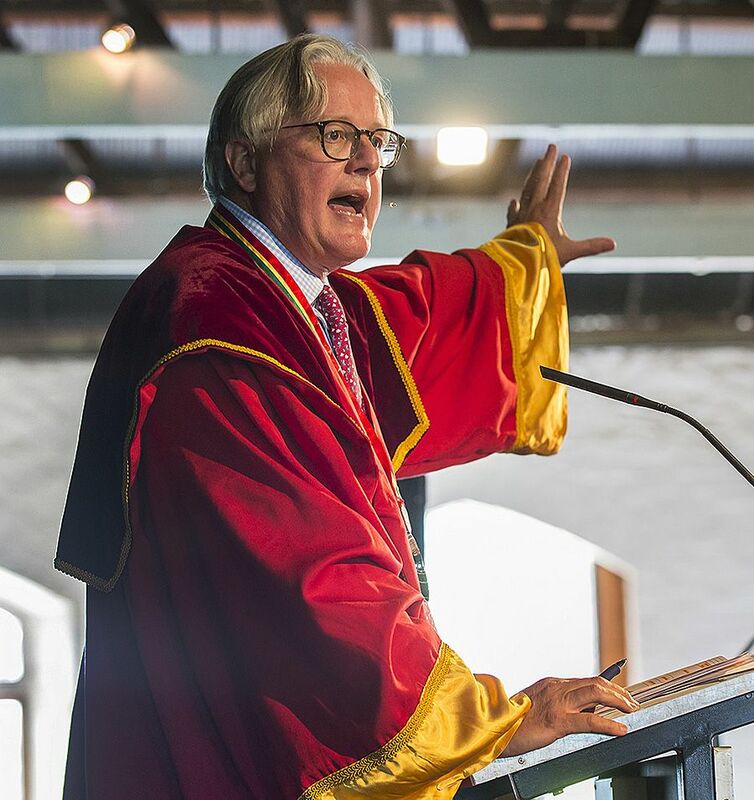 Andrew Caillard MW, a ‘Baron of Barossa’ – a title rarely given to non-Barossans, at work during the 2017 biennial Barossa Wine Chapters Auction : Photo courtesy of the Barossa Herald. I first sat the exam in 1992 and passed the theory part. Andrew Caillard went through with me and he passed before me. I had a few attempts at the tasting. In 1996, Rae and I moved home to McLaren Vale and I finally passed the exam in 1998. I learnt a lot, I don’t want to compare it to Roseworthy, they were both incredibly valuable but it did take me to a different place. I’m very glad I did it. I’m still involved as a volunteer. I’m involved in helping new students prepare for the exams through the education program. You bought the winery from your parents in 1996 : did you plan to make any changes ? By the time I came here I had a lot of experience under my belt that really helped us. We were very lucky taking over in 1996 because it was the beginning of another red wine boom. It was fate how I ended up back here. The Winery Block planted in 1934 : Photo © Milton Wordley. Mum and Dad had asked a few years earlier if I was interested in taking over. My journey wasn’t complete at that stage, I was discovering other things and I just wasn’t ready in terms of valuing this place. I said thanks, but no thanks. At the time I wasn’t sure I wanted to come back to McLaren Vale, so they put the property on the market. Then one Sunday afternoon Mum and Dad rang and told us they had sold the place but the deal had fallen through. 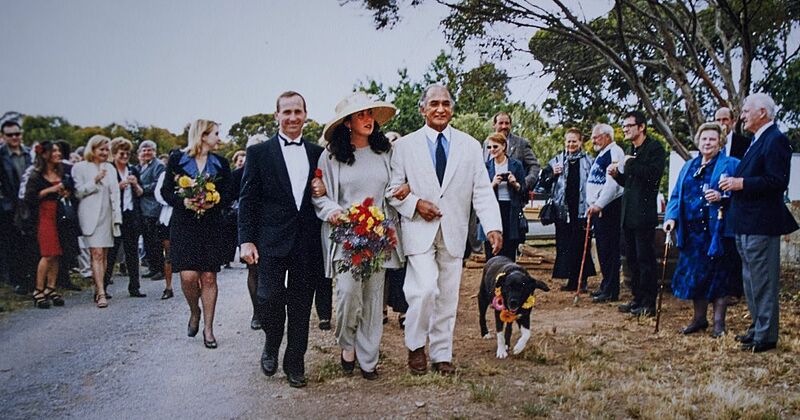 Rae and Drew’s wedding, November 1999 with Rae’s father Kura and their dog August : Photo courtesy Noon Winery. We decided then and there that we should take it on ; we didn’t even know the price. 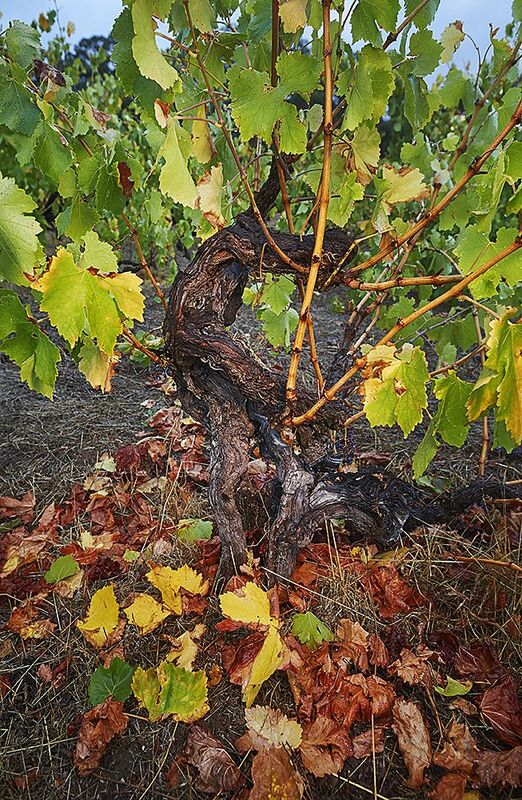 Dry grown bush vines planted in 1943 : Photo © Milton Wordley. When we arrived home Rae cried, she had never seen bush vines in winter before. It was cold and windy, the vines were dormant and lost in the grass. I’m sure she and her father thought we’d go broke. We decided to give it five years. There were a couple of things we planned to change but not as many as if I had taken over earlier. I’d been away for 15 years and there was a lot I didn’t want to change. Mum and Dad sold the wines mostly at cellar door and I knew I didn’t want to change that. They had also built a mailing list and I knew we were lucky to have it. We still have some of their original customers and that’s important to us. We were taking over at a good time and we had a base to build on. I think of young people starting up today and how hard it is. We also had customers that knew we were here because Noon’s had been around a while. We were just bloody lucky really and after three years we knew we’d made the right decision. And any winemaking changes ? Drew with his father David during the 2007 vintage. Photo © Rae Noon. Dad was always open to change. He valued new ideas and I’m sure he had too much of an apple in his eye for me, so I was lucky in that respect. However his winemaking methods were sound and only needed minor adjustments. When we got home he was 70 years old and he said “here’s the keys”. He was ready to retire and he knew I was ready to start. The wines haven’t changed much, freshened up a bit but made pretty much the same as they have always been using open vats and basket presses. It’s a family winery, how do you and Rae work together ? One of the things I discovered in my time away was that I liked the craft of winemaking, the pruning, vintage, racking into barrels and so on. 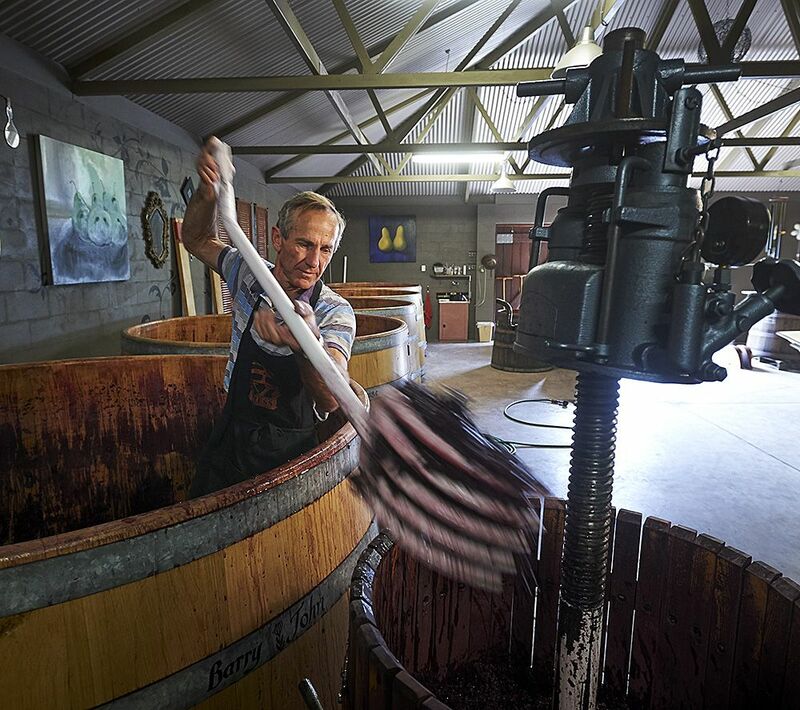 Drew working the cabernet during the 2018 Vintage : Photo © Milton Wordley. I liked making wine but I found managing staff stressful so we decided to keep the business small. It’s mostly just Rae & I. She says she’s served a twenty year apprenticeship. We have our separate jobs through the year, but work very closely at harvest and wine release time – usually without too many issues ! We do tastings together and I couldn’t do it without her opinion. I rely on Rae as a critic who is not a winemaker. 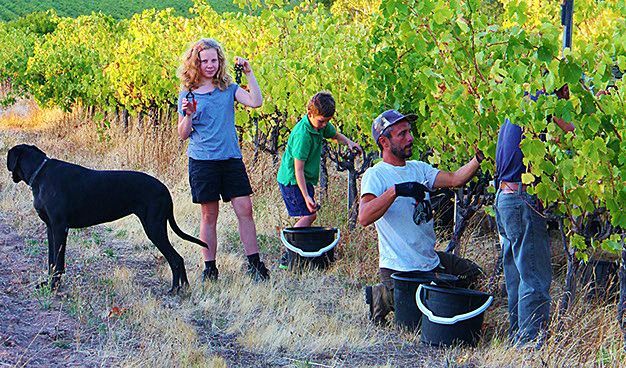 It’s a family business, the Noon kids Indi and Harper help out during vintage : Photo courtesy Noon Winery. It works very well as I’m often a little too close to the wines and she’s impartial. You’ve mostly got to trust yourself but the other person I trust on the tasting bench is Rae. Our kids have been terrific…having them has encouraged us to get out and expand our horizons. We have never been involved in sport before but Harper loves soccer, so we try to get to all his training and matches. We are off to a wine conference in Spain next month. The kids are coming as well, so we’re going to try to catch a soccer game in Madrid. Harper hopes to see Cristiano Ronaldo! Your web site has this message “Light wines… it’s just not us!” so what style of wine do you make ? The reserve wines : Photo courtesy Noon Winery. About five to ten years ago when there was a move away from bigger reds to lighter wines, Rae and I decided we would continue to make wines as we always have. That is what our vines naturally produce. Soils and wine: I believe you are involved in the McLaren Vale Districts project, where is that up to ? It’s a fascinating subject, there’s a lot to learn and I can’t give you all the answers but it’s an area I have become more interested in. Philip with his eyes on the rocks. Photo : Kate Elmes. I’m working closely with a few other winemakers in the area using the geology map that Philip White has been involved with. We’ve drawn some rough district boundaries on the map based on geology and climate. We have an annual blind tasting of wines from these districts submitted by producers from around the Vale to see if we can distinguish one district from another. We have been doing the tastings for 10 years now. It’s really interesting because we can consistently taste differences between some of the districts. I have a more recent interest in the role of microbes in the soil and how that influences the expression of terroir. That will be a topic of discussion at the conference we are going to in Spain and I’m really looking forward to it. On our winery block there is a big change in the soil and we have marked this with steel sculptures because the wines taste different where the soil changes. Langhorne Creek: McLaren Vale, why vineyards in both ? 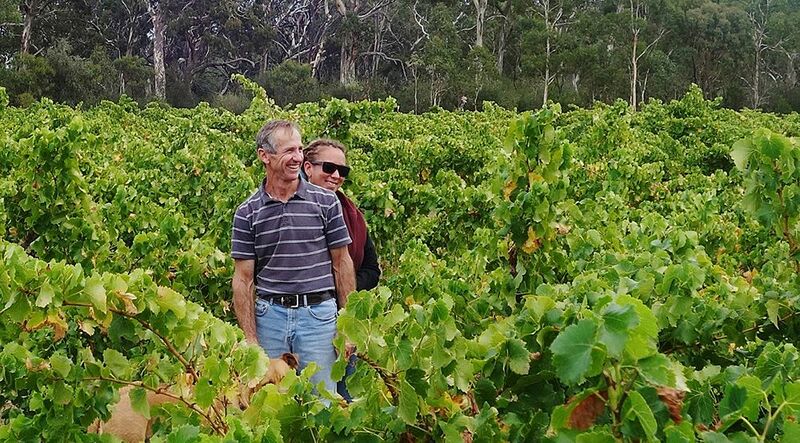 We inherited our relationship with the Borrett family in Langhorne Creek from my parents. 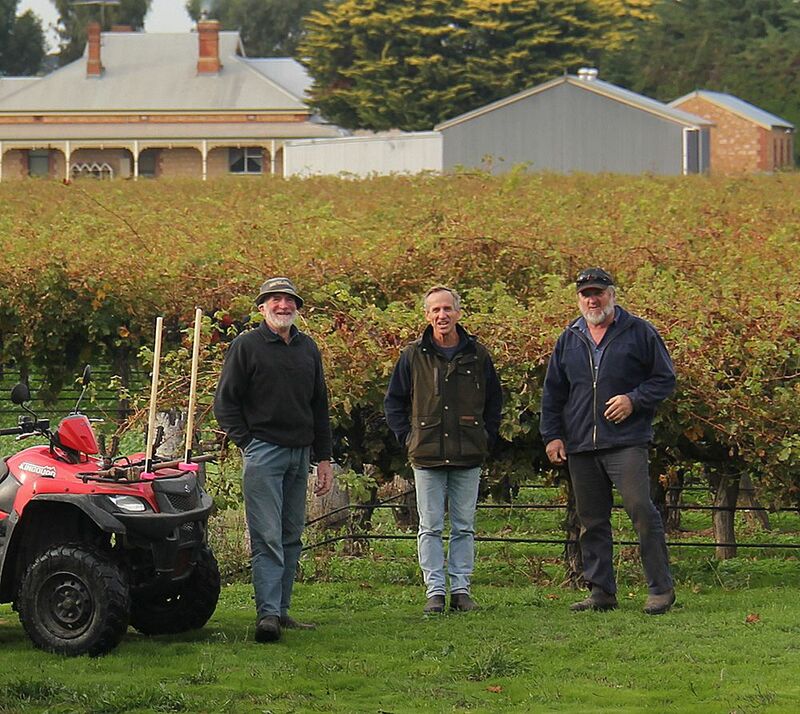 Drew with the Borrett Boys in the headland of the Fruit Trees Cabernet Block, Langhorne Creek : Photo courtesy Noon Winery. My Dad used to buy grapes from George Borrett’s dad and now I buy grapes from George. The vineyards we source from are on the original floodplain country just past Bleasdale. We only ever grew Grenache and during the 70’s red wine boom everybody wanted Cabernet. Then in the early 90’s, everyone wanted Shiraz so dad bought both varieties from the Borretts. Langhorne Creek is about an hour’s drive from McLaren Vale and both regions share a maritime climate. There is a similar softness in the tannins that we love. 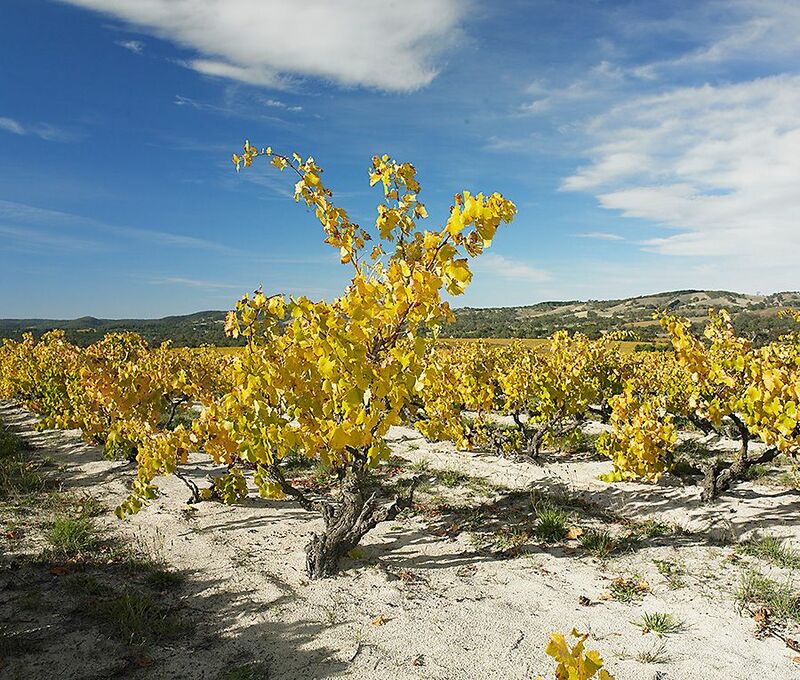 What is it about Grenache and dry grown bush vines ? I think that age is part of the reason that wine from these vines is special. It is also because they are low yielding and are hand pruned and picked. I think Grenache is naturally suited to McLaren Vale’s climate and the winemaking is also more sensitive than it used to be. As with Pinot Noir, Grenache is hard to upscale without losing quality. 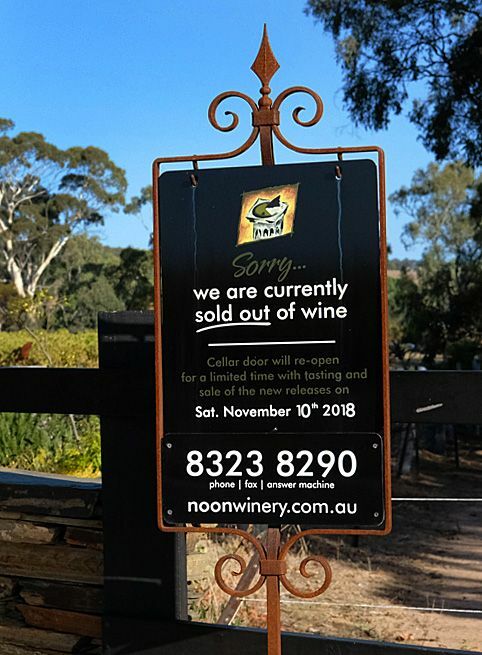 The Noon Cellar Door sign, mostly reads “Sorry we are currently sold out” : Photo courtesy Noon Winery. A spot on your mailing list commands Wendouree-like bragging rights. When did you get the idea to market Noon as you have and only open the Cellar door for three weekends a year ? We didn’t plan to only open for such a short time, it just evolved. Some of that is through choices we’ve made not to get bigger. We are happy being small-scale and enjoy hand making the wine. Living this life and having the connection with our customers is what we love. It’s not for everyone but it suits us. Anything else you’d like to say ? “We drink our reds too old and our whites too young” and as someone who got to love old Hunter Semillon. 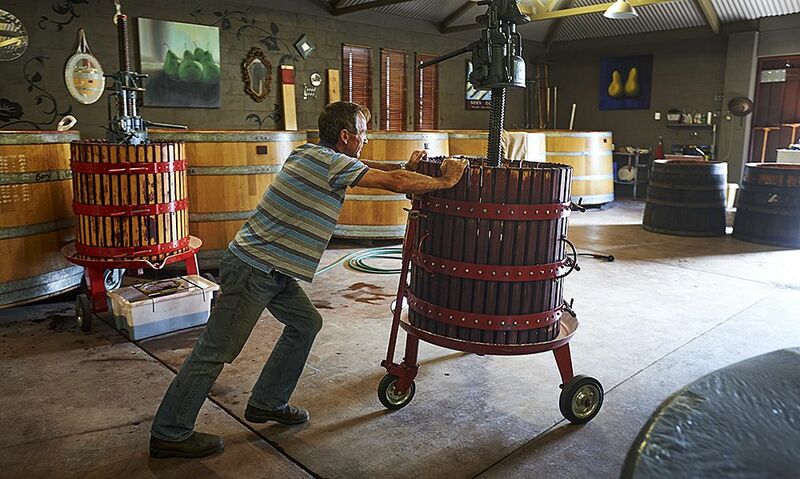 Just making wine is what Drew loves to do : Photo © Milton Wordley. Special Thanks : Rae Noon for all the help with the old photos.